Anticipation – n. realization in advance. As 1948 dawned there was absolutely no anticipation amongst the public for the next move of Wynonie Harris. Though a fairly well-known singer with a handful of hits in his pocket from three years prior, Harris’s career since then had been an uneven and often maddening exercise in trying to find a fit in the music scene that was evolving around him. By now you’d be forgiven if you felt his career seemed as though it was winding down, not rising up. Today, in 2017, knowing what was to follow, being fully aware of his role in the popularization of rock ‘n’ roll itself and his establishing the prototypical frontman persona that exists to this very day, we have a great deal of anticipation for what we know is to follow. It’s no secret to us that around the corner Harris will set the world afire with a record that will mark rock’s explosion as a big-time entity. Looking back from the present we can see that once the rock fuse was lit by Roy Brown in September 1947, everything which followed over the next few months was anticipatory of the ensuing explosion once that fuse inevitably reached the gunpowder. The gunpowder, we know now, was Wynonie Harris. But we didn’t know that then, or rather those keeping tabs on the music trends of the day, even those intrepid folks whose commercial interest had already started to make this raucous cacophony called rock ‘n’ roll something of a moneymaker, had no idea that Harris would factor into its rise at this point, let alone be poised to soon take it over. So in retrospect with our modern awareness of what is still to come from him it is fascinating to see what Harris delivers for his first release on King Records after jumping from label to label over the previous three years, sinking deeper into journeyman status before his King output revived his career and became the label for which he’ll remain at longest and churn out hit after hit in rock’s formative years. Thus the question we have goes back to the word that opened the review… Hearing this record is there any way we, or more specifically, audiences at the time, could have anticipated the explosion that was to follow? The answer, as I’m sure you’ve all guessed by now, is a resounding NO! All Hail The Mighty King! King Records had been founded in 1943 by Syd Nathan, an irascible, near-sighted asthmatic who once upon a time reputedly was a drummer and had failed miserably at every business he’d tried to get into, from promoting wrestlers to selling photos to tourists in Florida. His fortunes turned around when he opened a record store in Cincinnati, a key spot in that it was an urban location surrounded by rural areas of West Virginia, Kentucky and Indiana. Thus he saw firsthand the interest that both blacks and rural whites had in music aimed squarely at their tastes and decided to make records for himself to serve both constituencies. As with most independent labels King Records sought to fill a niche, providing the music for those people – the little man, as he put it – whose tastes were largely being ignored by the majors. He started with country music and built up a pretty fair catalog in that field before launching a subsidiary label called Queen, which would focus on black music. Though a hard-driving task-master prone to yelling, screaming and berating those he dealt with Syd Nathan was also incredibly far-sighted in building his company. Dissatisfied with relying on others to press and distribute his records he simply built his own pressing plant and set up his own distribution network, thereby eliminating the middle-men and exerting full control over his final product, right down to the artwork that would later adorn the albums. Musically he was just as visionary, although here too it was with an eye on the bottom line first and foremost, as he actively pushed for the same songs (for which owned the publishing, natch) to be recorded by artists in both fields, country and R&B, thereby doubling his income if they each sold well to their own fan base but in the process bringing the styles together in ways that might not have otherwise happened. Socially he may have been even MORE visionary as he hired blacks to serve as producers and A&R men in an era of – and a region notorious for – strict racial segregation. Most notable in this regard was Henry Glover, a former trumpeter in Lucky Millinder’s band who’d go on to be one of the top songwriters and producers in rock history. Nathan then allowed Glover to not only oversee records by black rock artists as would be expected, but white country acts as well. 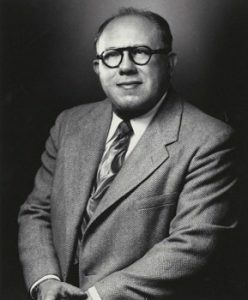 His views on racial equality when it came to opportunity and treatment throughout his company were revolutionary at the time. By 1947 he’d shelved the Queen imprint and simply brought black artists onto King Records, thereby integrating them in the public’s mind as well. No longer just a country label it now encompassed the full range of American music and as the calendar turned to 1948 was poised to make its mark in the up and coming rock field led by one man in particular. When Wynonie Harris signed with King Records at the end of November everyone in the music industry was well-aware of the recording ban that was looming when the sand in the hourglass ran down as 1947 closed. Fearing they’d run out of new material to release should the strike last as long as the last one (1942-1944), companies were frantically stockpiling material to have on hand to weather the storm. In Harris’s case they were starting from scratch since he hadn’t done even one session for the label and consequently they had no track record to know for sure what might offer the best bet for success. The fact he’d HAD success in the past with his swaggering lusty shouting style certainly gave them an indication of what he did best, but as we saw with the execrable Big City Blues none of his records had clicked with the public for quite awhile. On top of it all musical styles were changing rapidly now and though it seemed on the surface that this new emerging one might be something Harris would excel in, they certainly couldn’t be sure. Nor could they even know how long it would last. But they all knew that they wouldn’t have time to really experiment either. Time was running out, for not only did they have to get a sizable war chest of tunes on Wynonie down on tape, but also the rest of their roster as well before the clock struck midnight heading into New Year’s Day. Thus Harris was going to have to basically wing it and hope that something he did hit on the right formula… except nobody, least of all Wynonie himself, knew what that formula was. So it’s not at all surprising that Harris instinctively reached back to something he’d done before, a two year old performance called “Dig This Boogie” that he simply refashioned, updated a bit with a new arrangement to take into account the different musicians he was working with, and thereby he’d have something which he’d at least feel comfortable laying into. 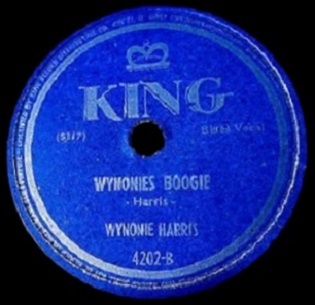 Oh, and he also renamed it after himself – Wynonie’s Boogie – so the egotistical Harris would be the unquestioned focal point and the recipient of whatever attention it garnered. He needn’t have worried about the latter. Harris has the right idea in revisiting this, as it’s ostensibly a song designed to champion the music he’s singing about, a vital aspect of rock’s early swaggering sense of self, so it’s easy to see why this was an important first step for him towards something bigger, but ironically he’s let down by the very music he was celebrating. It’s STILL too refined, leaning unnecessarily on yesterday’s styles and not enough on riding the coming tidal wave of unbridled freedom that had just come into view on the horizon. The horns take a much more featured role in this version than on the earlier take which is good in theory but they’re locked into a mannered approach that weighs it down. Already the best rock sides coming out were turning them loose, led by the honking tenor sax not the trumpet as is heard here, and whipping the mood into a frenzy. Here they don’t approach a frenzy at all, more like a quiet buzz at best. The piano – which had been the centerpiece of the original, played by the idiosyncratic Sun Ra – has some nice moments with Skippa Hall at the keys trying to spice things up in the cracks, but it too is holding back, afraid to make a spectacle out of itself as would be its role more and more in the coming weeks, months and years. There’s a built-in restraint in the overall arrangement that keeps you from giving yourself over to it and that timidity which was so valued in most other styles of the era was what rock needed to rid itself of in order to firmly establish this music as offering a vital change to the accepted order of things. As for Harris himself you can tell he wants to break free of this but doesn’t quite feel as if he’s able to. His vocal tone is good and the inflections he adds make the even the most insipid lyrics here sound mildly risqué, but aside from the sly attitude he projects there’s nothing much going on. There’s no story, no directives urging you to cut loose, strip down and dance with the devil, no unrestrained passion where it wouldn’t matter so much what he was singing just as long as he sounded as if the gates of hell were about to be torn from their hinges at any moment. Instead he reigns himself in, dutifully beholden to the cautious arrangement. He swings to a degree, but it’s with his ankles bound together ensuring he can’t take too big a leap into the future. Baby steps are all he’s allowed to take here and rather small ones at that. But just as the baby furtively eyes the door in the distance for the moment when his mother isn’t looking, Harris seems to be almost plotting his move to escape the shackles of yesterday as well. The artistic fork in the road all artists were coming to at this point in time was apparent here in his first recording session for King. While he wound up taking a wrong turn on this day and headed down a dead end street with Wynonie’s Boogie they’d all simply turn around and try again at another session held just two weeks later and the route they’d take that day would prove to be the road to riches and glory. This particular trip was a disappointment, sure, but the destination we all have in mind will soon be coming into sight around the bend and that’s worth the few extra miles it’ll take to get there. Leave a reply on "Wynonie Harris: “Wynonie’s Boogie”"